failures behind a burgeoning crisis. The growing lack of proper help for the mentally ill in society at large has led to the wrongful imprisonment of unprecedented numbers of people whose crimes are the result of psychosis. Pfeiffer also lays bare the woeful absence of proper psychiatric care within the prison system. Correctional officers, lacking the training and even basic understanding to deal with disturbed inmates, routinely resort to punitive measures, like solitary confinement, that are psychologically devastating. 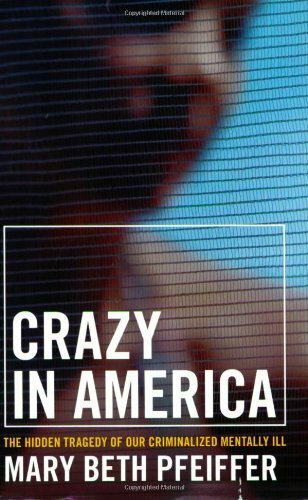 Crazy in America is an indictment of a society that incarcerates its weakest and most vulnerable citizens--causing them to emerge sicker, more damaged, and even potentially more violent than when they were first imprisoned. It is a compelling and important examination of a shocking human rights abuse in our midst--our persecution of those we are unable, or unwilling, to help.